The North of Switzerland is an area of interest for geothermal studies since it hosts a prominent heat flow anomaly with an enhanced near-surface heat flux when compared to the Swiss average. The anomaly is situated within a permo-carboniferous trough and one hypothesis about its origin is that geothermal fluids migrate upwards along permeable pathways, carrying heat from the crystalline basement into shallower layers. This is also suggested by the existence of several warm water springs in the region. However, that underlying nature of the anomaly remains unclear. For our investigations we use Magnetotellurics (MT) – a geophysical sounding method that is widely used in geothermal exploration (e.g. Munoz et al. 2014, Samrock et al. 2015). MT is based on the analysis of natural variations of the geomagnetic and electric fields at the Earth’s surface. It aims to recover the 3-D electrical conductivity structure of the subsurface at depths relevant for geothermal exploration. Crustal conductors are often thought to represent mechanically weak zones that provide permeable pathways and fluid storage. 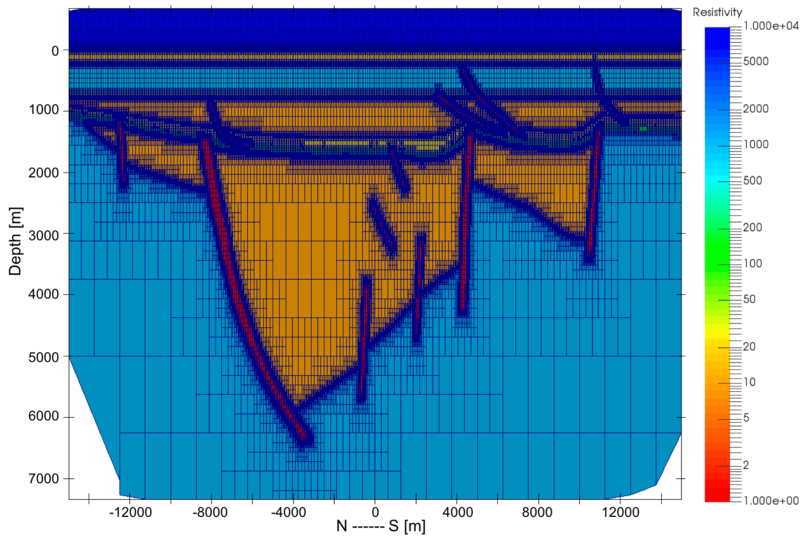 A 3-D electrical conductivity model, recovered from MT data, would provide insight into the extent of the permo-carboniferous trough at depth, the basement structure, and the existence of electrically and hydraulically conductive zones. For numerical modelling studies of MT data, we use novel 3D codes that have been developed at ETH (Grayver, 2015, Grayver et at., 2015). With these studies we try to better understand the effect the presence of permo-carboniferous trough has on the MT data. We further investigate whether permeable structures such as faults and fracture networks impact the MT transfer functions and what scale of permeable structures are detectable. So far we measured data at 14 sites during a pilot MT study at the Northern Swiss Heat Flow Anomaly in early 2015. With this survey we initially analyze the electromagnetic noise level, data quality and evaluate the potential of MT surveying in this region. Grayver, A. V. (2015). Parallel three-dimensional magnetotelluric inversion using adaptive finite-element method. Part I: theory and synthetic study. Geophysical Journal International, 202(1), 584-603. Grayver, A. V., Kolev, T. V. (2015). Large-scale 3D geoelectromagnetic modeling using parallel adaptive high-order finite element method. Geophysics, 80(6), E277-E291. Medici, F., Rybach, L. (1995). 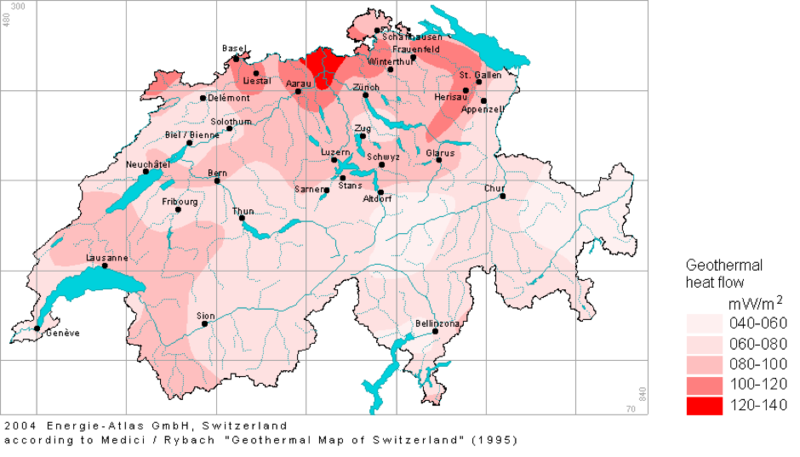 Geothermal map of Switzerland 1995: (heat flow density) (No. 30). Commission Suisse de géophysique. Muñoz, G. (2014). Exploring for geothermal resources with electromagnetic methods. Surveys in geophysics, 35(1), 101-122. Samrock, F., Kuvshinov, A., Bakker, J., Jackson, A., Fisseha, S. (2015). 3-D analysis and interpretation of magnetotelluric data from the Aluto-Langano geothermal field, Ethiopia. Geophysical Journal International, 202(3), 1923-1948.